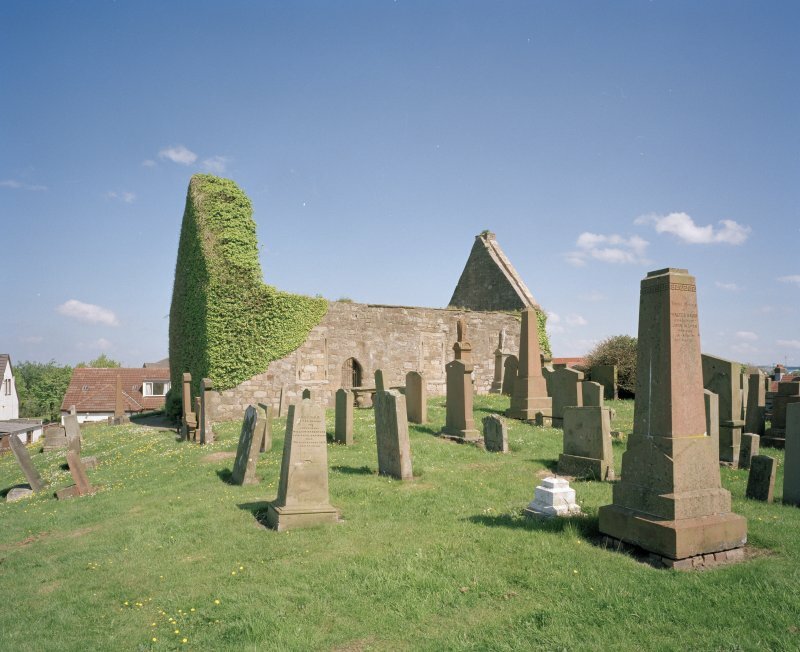 The Object Name Book of the Ordnance Survey describes the ruined church as 'Stands at the north west end of Prestwick village and was unroofed, and the walls repaired in 1837 to preserve them from falling. It is a building of very ancient state and is supposed to have been erected about the 11th Century. The walls are one storey high with two gable ends on one of which is surmounted a small befry with bell. Property of Prestwick burgh' . Nat. Lib. Country Life, October 19th 1940. - Gravestones with Plough team on them. The ruins of St Nicholas' Church stand on a mound near Prestwick railway stations, surrounded by an ancient burial ground. It is a simple oblong on plan, 44ft x 20ft internally, and very plain, evidently having been altered, with square headed windows inserted to make it suitable for Presbyterian services. It is a 12th century building, much altered in later times (H Scott 1920). The only noticeable features are the two massive buttresses at the E end. It was in use till 1837. This roofless church is a plain, rectangular building. Its walls, which are complete, contain filled-in squared windows and semi-pointed arch doorways; the present entrance is on the S. The buttresses and walls indicate an early period, but the building has been considerably restored, probably during the 17th century as its style suggests. No conclusive dating evidence was obtained. The church stands on an elevated plot of ground and is in a fair state of preservation. No change. The churchyard has burials as recent as the 1950's. 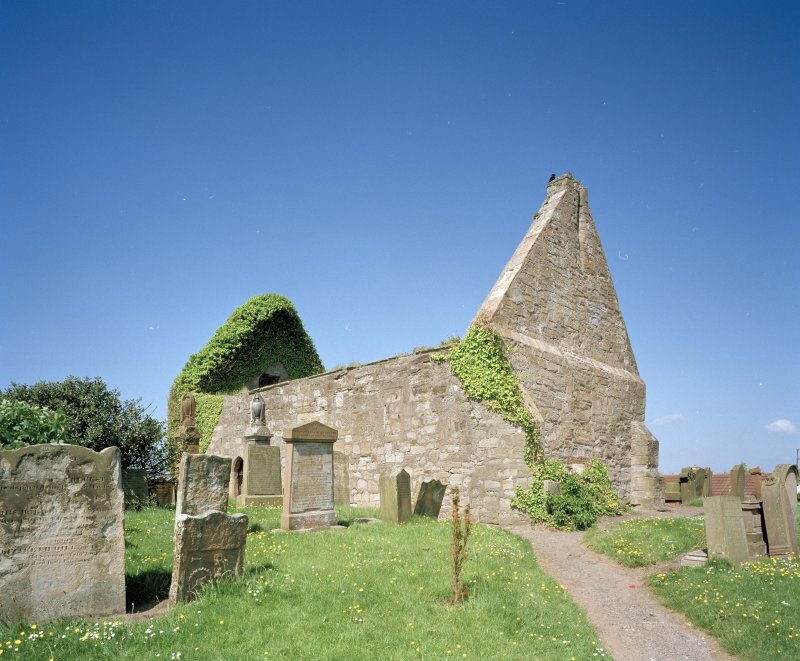 The roofless ruin of this medieval parish church (dedicated to St Nicholas) stands within its walled burial-ground on a slight knoll close to the shore 250m NNE of Prestwick railway station. It is gable-ended and rectangular on plan, measuring 13.15m by 6.05m within walls 1m thick. The gables are buttressed; that on the W rises from a chamfered ground-course and that on the E (to which a belfry was added) has an offset at the height of the main wall-head, where there is a chamfered eaves course. Opposed doorways, with arch-pointed heads, are situated towards the W end of the two long walls. Blocked openings include two windows at the E end of the two long walls and another in the E gable. Two moulded capitals incorporated in the blocking appear to be of 13th century date and it is probable that the existing building was erected at this period. During the 18th century two windows were inserted in the S wall. Between 1165 and 1172 the church was granted by Walter FitzAlan to the Monastery at Paisley, and during the late 16th century the parish was united with Monkton; the church continued in use until 1779. NS 3508 2647 An archaeological watching brief was carried out in February 1996 while cable trenches were excavated for floodlighting in and around the ruined 13th-century church. The brief specified the depth for the trenches, so limiting disturbance to archaeological features. As the cables were going through the cemetery there was a high risk of encountering human remains. As it turned out the only bones that were found had already been disturbed and were found within the topsoil. No burials were disturbed and the stray bones were reburied immediately. Sponsor: Kyle & Carrick District Council.